You don’t have to live in Texas to enjoy these soft Texas Cowboy Cookies! You can also change the recipe and add some ingredients to suit your taste buds such as pecans, coconut, corn flakes, etc.. 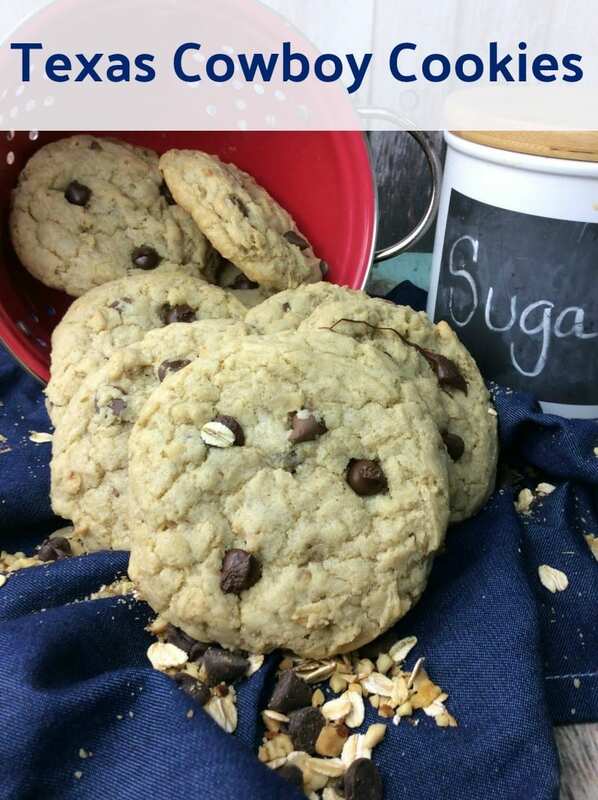 It all comes together and makes a delicious cookie that is crispy on the edges and perfectly soft and chewy in the middle. Everything’s bigger in Texas, right? And so are these cookies! In a large bowl with a hand mixer or a stand mixer, beat the butter until it is light and fluffy. Add your brown sugar and white sugar and beat well, scraping sides and bottom. Add the flour but don’t mix it in. Add the oats, and walnuts, to the bowl. Add the peanut butter chips and chocolate chips and mix until everything is combined. Use a 1/4 cup measuring cup to scoop these onto the pan. Leave at least a couple inches in between each ball of dough. Bake at 350 for 13-14 minutes, until the cookies are golden on the edges. I hope you enjoyed the Texas Cowboy Cookies Recipe. If you make it, make sure to share with us on Facebook or Twitter! Also, check out all of our other Recipes. These sound really good, a little bit of everything in them!! yum yum!! These sound amazing, thanks for sharing! These cookies sound so delicious. Thanks for sharing this recipe! I love soft cookies but not peanut butter nor the oats. I’m guessing that I could substitute white chocolate for the semi sweet, can I just use butter instead of peanut butter and just omit the oats do you think? It’s peanut butter chips, so I would just omit them all together or add other chips you might like.You can also substitute for other ingredients such as coconut or other nuts. If you omit the oats, you will need to add more flour. Big cookies, just the way I like them! Thank you for sharing your recipe. The grandkids are always wanting cookies at our house. My family would love this one. Thank you for sharing it! Im sure its going to be a hit. This really looks delicious, and I like how simple it seems to make. Im trying to decide whether to try it today or over the weekend. Either way, thank you for sharing it! Thanks for sharing these sure look delicious! « Get Ready to Explore Canada at #LearnToCamp with Parks Canada!